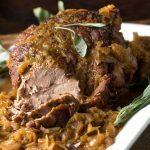 This delicious pork roast with sauerkraut apples and onions has just 5 ingredients and takes only 20 minutes of prep. It comes out of the oven tender and flavorful, with with lots of delicious gravy. I’ve rediscovered the magical powers of my oven making this pork roast. 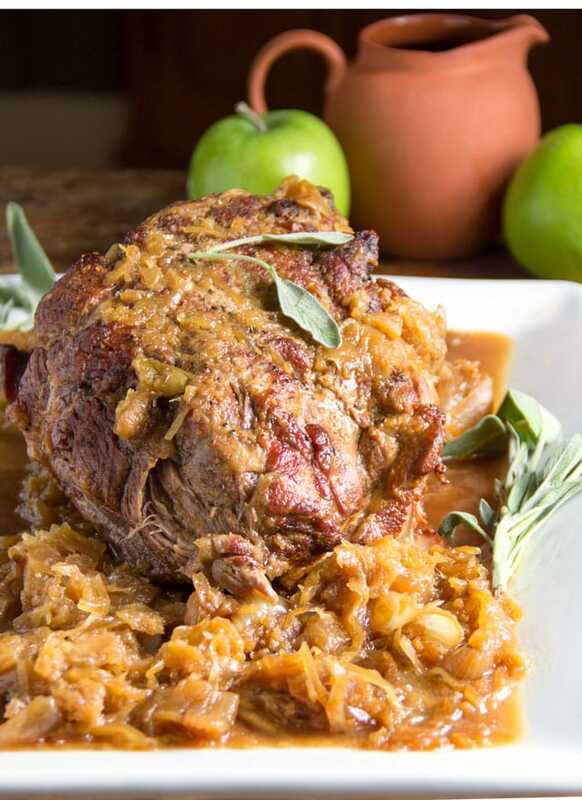 In goes a huge hunk of raw meat, with shreds of sauerkraut, sliced onions, wedges of green apple and cider syrup. Two and a half hours later, out comes the most tender delicious roast of pork with an abundance of golden sweet and sour gravy, calling out for mashed potatoes to soak it all up. Pork and sauerkraut are meant for each other. They’re paired frequently in savory soups, stews and roasts throughout Eastern Europe and in pockets of the USA. There are reasons why pork and sauerkraut are so commonly found in the same pot. It’s not just about the taste. Some people believe that eating pork with sauerkraut brings good luck. That’s why, for some, it’s a ritual to eat pork with sauerkraut to celebrate the new year. It bodes well for good luck and blessings to come in the year ahead. The ‘good luck ahead’ theory comes from the fact that pigs root in the dirt with their snouts moving in a forward direction. The concept of moving forward and making progress in the new year, combined with the fact that pigs are robust and get plenty of food, implies a future of wealth and prosperity. Sauerkraut is also symbolic of good things to come. In Germany people wish each other as much happiness and prosperity as the number of shreds of sauerkraut in the pot. While my family never considered pork and sauerkraut to be good luck, we did have our own tradition around eating it. When I was a kid, my mother was often on a diet and watching her weight. Mom’s big, once a year treat, on her birthday, was to eat a hot dog with sauerkraut and mustard from the Sabrett hot dog cart in Central Park (NYC). She considered that the ultimate birthday splurge. We’d walk over to the park together. I’ll never forget how excited I was for that dripping wet hot dog nestled into a bun with sauerkraut and a long wiggly line of Gulden’s mustard. My tastes have evolved and expanded over the years but I still love a good hot dog with mustard and sauerkraut. This pork roast is a celebratory dish, but one that can be enjoyed for any occasion, from Sunday dinner to New Year’s Eve. It takes minimal effort to prep and it’s great for feeding a crowd. Make sure you have mashed potatoes or mashed cauliflower to soak up the sauce. A simple sauté of spinach, kale or collard greens would make a perfect side. 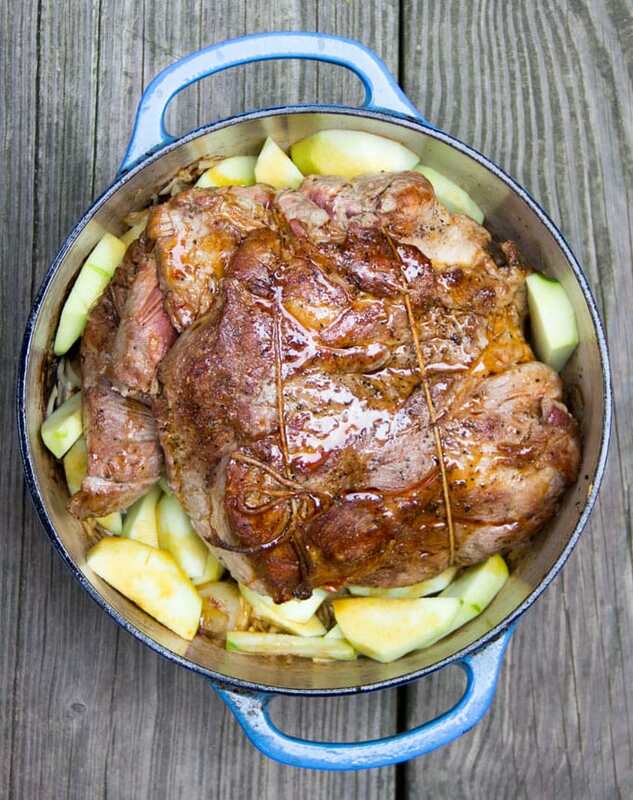 Here’s the recipe for pork roast with sauerkraut, apples and onions. I hope if you make this you’ll come back and let me know how you liked it. A hearty, festive roast pork with lots of delicious sweet and sour gravy. Just 5 ingredients and only 20 minutes of prep time. Preheat oven to 400ºF. Season pork generously with salt and pepper. Tie it up with kitchen twine if there are loose pieces that need to be held in. Heat olive oil in a large Dutch oven over medium high heat until hot but not smoking. Brown pork for about 5 minutes per side until most of it has a nice brown crust. Transfer pork to a plate. Pour all the fat out of the pot and into a heatproof cup. Add 2 tablespoons of fat back to the pot. Add the onions. Reduce the heat to medium and cook onions for 10-12 minutes, stirring occasionally, until they soften and start to brown. Stir in sauerkraut and half the apple slices. Drizzle with 2 tablespoons cider syrup. Season with a little salt and pepper. Put the pork on top. Scatter the rest of the apple slices around the pork. Drizzle the remaining 2 tablespoons of cider syrup over the pork. Cover and cook in the hot oven for 30 minutes. Turn the oven temp down to 325ºF and cook, covered, for 2 hours longer, until it’s nice and tender and cooked through. Disclosure: This post contains affiliate that help support this site. When you click on a link to an Amazon product and make a purchase, a small percentage is payed to Panning The Globe, at no cost to you. Your support is greatly appreciated! Delicious and great for leftovers (if there are any). I’ve been looking for things to make in a cast iron Dutch oven. I recently started using cast iron. Came across this and tried it. Had an issue with finding the cider syrup. So I made some for myself. Basic and easy to make. This basic roast seemed to simple to be true. I have to say that this is by far is the best roast I’ve made to date. Can’t wait to share this with friends. You just made my day Steve. I love your comment! Thank you. And I hope you keep getting great results cooking lots of delicious dishes in your Dutch oven! If you end up trying it in the instapot, I’d love to hear how you do it and how it turns out. Hi, Lisa. This looks very intriguing. I had never heard of cider syrup before. My only problem would be getting the sauerkraut past my husband! Do you have any suggestions for side dishes using sauerkraut (Something smaller) I could sneak it into? BTW, I had a Polish friend that brought sauerkraut enchiladas to share for lunch one day. They went over very well, very meaty. I think this might be the perfect dish to introduce your husband to sauerkraut. The flavors meld so beautifully with the onions, apples and meat juices that you’re not aware of the sauerkraut. Or if you don’t want to chance it with a large roast, I suppose you could sauté sauerkraut with onions and put it on top of a hot dog, in a bun, with ketchup and mustard. It would be hard not to love that! I add garlic to such recipe and potatoes. 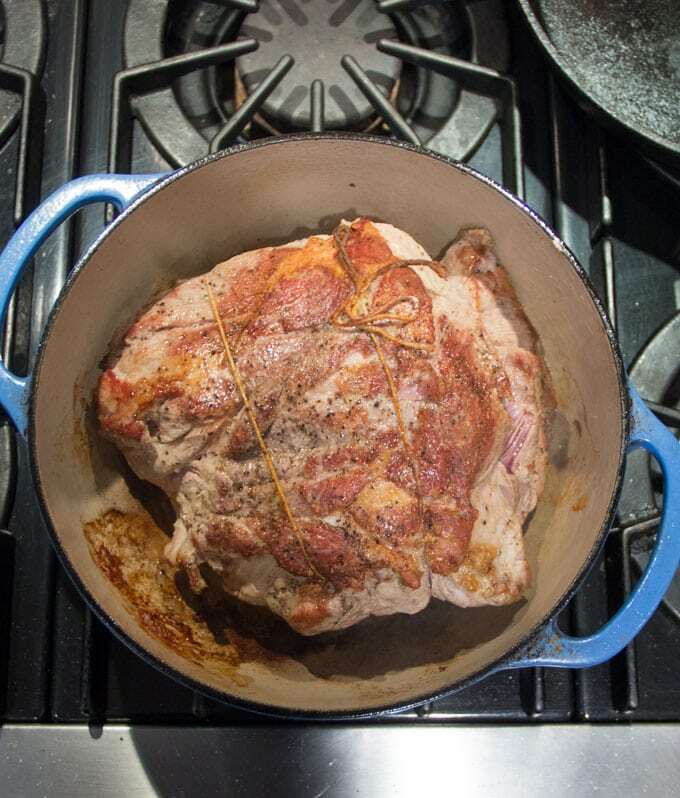 Also have tried it with shoulder steaks- all on top of the stove…Was wonderful. I added some white gold potatoes inside, too. Wow, this looks so good! I’m always trying to find another recipe to use my Bubbies sauerkraut in! I definitely need to try it; thank you so much for sharing! I love Bubbies saeurkraut – that the one I use. I get it at Whole Foods. I hope you enjoy the pork roast! 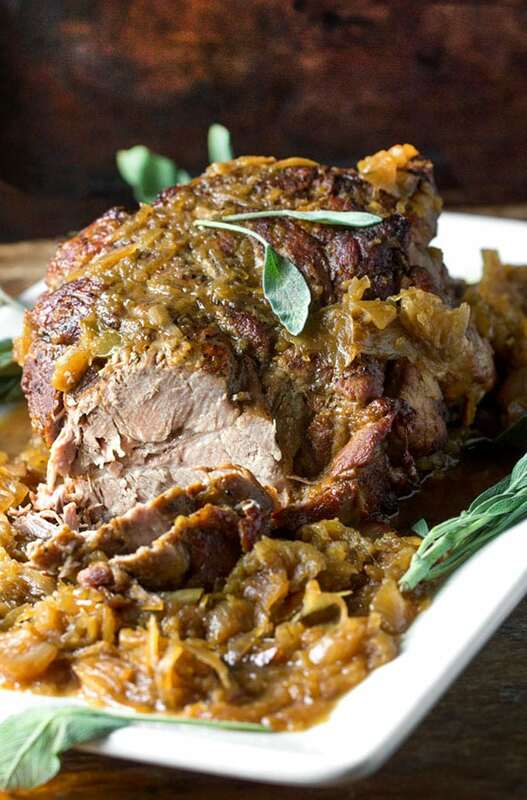 Never thought about having pork roast with sauerkraut but the pictures look tasty! Yay! Did this in the crock pot with much success. Browned the Pork in a cast iron skillet first and put it on low with sauerkraut and red onion. Added apples and fresh sage about two hours before serving over riced Cauliflower mashed with almond milk, ghee and chives. Really great. Thanks, Lisa! Yay! Thanks so much for letting us know Lori!! and your cauliflower mash sounds divine – a perfect accompaniment to the pork. This was outstanding!!! I made it tonight and we can’t wait for leftovers tomorrow. I used a pork shoulder with the bone in because that was on sale. I also used pomegranate molasses because I had it in my pantry. I loved the simple 5 (find anywhere) ingredients and it was so, so easy. 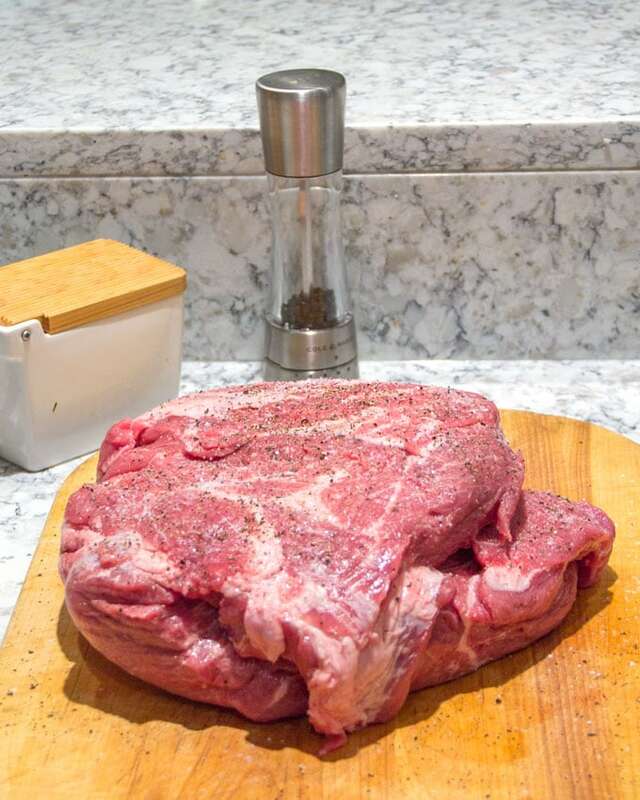 I will keep this recipe and make it whenever pork shoulder is on sale!